Pistol Bay (TSX.V-PST) announced that it plans to commence a 2018 drilling program on it’s Confederation Lake greenstone belt in the very near future. Additionally, the Company plans to survey the older drill holes on the Arrow Zone, which were drilled by Noranda in 1997 and 1998, using a gyro or similar method, to accurately determine hole deviation. Collars of all holes on the Arrow zone will be surveyed by differential GPS to determine their precise location and the initial azimuth. These new and precise measurements will allow more precise positioning of drill intercepts and will ultimately lead to a higher level of confidence in the mineral resource. Approximately 10 diamond drill holes totaling approximately 2,000 metres will test the Fredart “A” zone (also referred to as the Copperlode “A” zone). A historical resource estimate made in 1971 for the Fredart “A” zone, based on diamond drilling in the 1960s, was 386,000 tonnes grading 1.56% copper and 33.6 g/t silver, or alternatively 219,500 tonnes at 1.95% copper and 41.8 g/t silver. Neither of these estimates conforms to any class of mineral resource or mineral reserve defined by the 2014 CIM guidelines. Intersection lengths are core lengths; true widths are not known. Sampling, assaying, security and QC protocols are unknown. Technical information in this news release was reviewed by Colin Bowdidge, Ph.D., P.Geo., a Qualified Person as defined in National Instrument 43-101. December 21, 2017) – dynaCERT Inc. (TSX VENTURE: DYA) (OTCQB: DYFSF) (DAX: DMJ) (“dynaCERT” or the “Company”) is pleased to announce that it has secured a major new group of end users in Germany for its HydraGEN™ Technology. dynaCERT has received purchase orders for 520 HydraGEN™ HG1-45 model Units having a total suggested retail price of $4,067,000. The purchase orders were received from the dynaCERT’s dealer for Germany and Switzerland, Hoer&Hoer GreenTech. The Units are destined to KWK GmbH (“KWK”) which is part of a buying group with members constituting operators within the prolific agricultural industry that each manage one or more bio-diesel powered generators in the State of Bavaria and throughout Germany. The first 20 Units are scheduled for an immediate delivery in January 2018 and the remainder have a planned rollout throughout 2018, commencing in March. Over several months, a HydraGEN™ HG1-45 was successfully tested by KWK at its facilities in Samerberg, Bavaria, Germany. In September 2017, this HG1-45 was installed on a Perkins Bio-Diesel Generator. The generator has controls that monitor output power and fuel consumption. In the first few weeks of testing with the HydraGEN™ HG1-45, initial fuel consumption of the generator was reduced by 6%. As testing progressed, with adjustments of the HydraGEN™ using the Smart ECU, the engine was able to achieve and maintain a minimum of 17.5% reduction in fuel consumption and the resulting reduction of carbon emissions. November 29, 2017 – dynaCERT Inc. (TSX VENTURE: DYA) (OTCQB: DYFSF) (DAX: DMJ) is pleased to provide the following clarification on the recently released complete report on the PIT Group testing for Fuel Consumption and Emissions Tests of the HydraGEN™ Technology. dynaCERT is very pleased with the results of this test. As was provided in the PIT report, the testing was conducted under outdoor laboratory conditions whereby the test vehicle was driven up to the optimal operating condition of 105 kph (65mph) and, at that time, the cruise control was set and the test equipment activated. The driver then steered the vehicle around the test track at this constant speed and setting for 100 kilometers to complete the test. At that time, the test equipment and cruise control was turned off and vehicle returned to the start line. The testing was conducted with no change in elevations, no change in speed (up nor down), minimal wind conditions, and optimal weather conditions as would be experienced in perfect on-the-road conditions. This is the standard fuel consumption testing protocol for all vehicles regardless of make, model or options. PIT wrote to dynaCERT in an email separate to the report: “…for any kind of automotive technology, 5.9 % fuel savings is a result to be envied”. As previously reported in our press release dated November 20, 2017, PIT Group report states “The results are showing significant decreases in emission levels between baseline and final measurements, of almost half for carbon monoxide (CO), total hydrocarbons (THC), and for mono-nitrogen oxides (NOx).” Testing verified that the HydraGEN™ HG1 unit reduced emissions of CO by 48.1%, THC by 50.0%, and NOx by 46.1%, all of which exceeded our estimates. 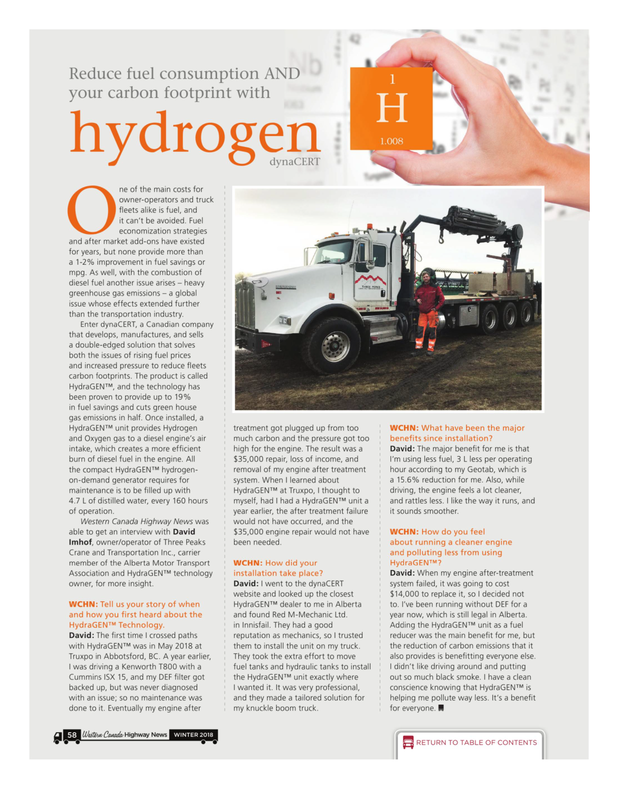 This puts dynaCERT and the HydraGEN™ technology firmly into the Hydrogen Economy and provides companies worldwide the opportunity to benefit from the Carbon Credit economy with proven Carbon Emission Reduction Technology. The subsequent Phase Two testing by the PIT Group on the test vehicles was conducted on October 31st, 2017 which by this date had the test vehicle travel double the previous distance. PIT then followed the industry standard test procedure based on TMC Fuel Consumption Test Procedure – Type II, RP 1102A (TMC 2016) as was done in the Phase One testing. Performance of the HydraGEN™ HG1 unit reduced fuel consumption by 5.9% when run at a constant speed of 105 kilometres/hour for 100 kilometers on a flat track. Please see www.dynaCERT.com for a copy of the PIT Group report titled “Fuel Consumption and Emissions Tests of the HydraGEN™ Technology from dynaCERT”. In the November 20, 2017 press release, incorrect information was provided on the additional benefits of the HydraGEN™ Technology. In quantifying such benefits to end users, the Company has considered the fuel savings achieved by PIT @ 5.9%, a reduction in the cost of replacing and cleaning Diesel Particulate Filters (PDF) for Class 6-8 trucks at a cost up to US$1500, Diesel Emission Fuel (DEF) savings at a cost of US$2/gallon and oil changes at a cost of US$200 per change. There are additional savings not calculated including, but not limited to, the reduced number of regeneration of trucks filtration systems and the reduced down time and maintenance associated with regenerations. The DPF needs to be cleaned regularly through a process called regeneration, either active, passive or forced regeneration. The accumulated soot is burnt off at high temperature (approximately 600°C) to leave only a residue of ash, effectively renewing or regenerating the filter, ready to take on more pollution from the engine. Future savings will also be realized from carbon credits and government environmental rebates once these are implemented. These additional benefits, combined with the Company’s new pricing and leasing strategy, show the Payback Period of the Company’s products to be under one year. Historically shown in real on-road conditions, confirmed through tests performed at the Automotive Centre of Excellence, specific amounts of hydrogen and oxygen introduced to the air intake of a diesel engine resulted in increased torque and power to the drive train, showing additional benefits when the truck is under stress, pulling loads uphill, and against strong wind and adverse weather conditions along with the lessened amount of gear changes required, even greater fuel economy can be realized. dynaCERT Inc. (TSX VENTURE: DYA) (OTCQB: DYFSF) is pleased to announce the complete report on the PIT Group testing for Fuel Consumption and Emissions Tests of the HydraGEN™ Technology. As previously reported in our press release dated September 21, 2017, PIT Group report states “The results are showing significant decreases in emission levels between baseline and final measurements, of almost half for carbon monoxide (CO), total hydrocarbons (THC), and for mono-nitrogen oxides (NOx).” Testing verified that the HydraGEN™ HG1 unit reduced emissions of CO by 48.1%, THC by 50.0%, and NOx by 46.1%, all of which exceeded our estimates. This puts dynaCERT and the HydraGEN™ technology firmly into the Hydrogen arena and provides companies worldwide the opportunity to benefit from the Carbon Credit economy with proven Carbon Emission Reduction Technology. As reported on September 21, 2017, in the Phase One test period the test truck was operated for 36 days from June to August 2017, this operation was not continuous as had been planned in order to decarbonize the engine with the HG1 unit. As a consequence, the test engine did not meet the necessary planned break-in requirements for achieving expected fuel efficiency, but such break-in is not required to realize emission reductions. dynaCERT elected to continue the fuel consumption testing to Phase Two using these same vehicles to maintain continuity and ensure proper test procedures were followed. The Company is very pleased with the results of this test and confident that due to increased torque and power from the addition of our technology to diesel engines, better results can be achieved on real on-road conditions and can improve over time while in use. These new PIT Group results, together with previous testing at the Automotive Centre of Excellence (“ACE”) as previously reported in the Company’s Press Release of November 15, 2016, indicate the important capabilities of the HydraGEN™ technology. Moreover, the various conditions of the ACE testing which emulated varying road conditions with a dynamometer, showed that while altering the flow of gasses of H2/O2 with our HydraGEN™ unit, test results verified a range of fuel consumption reductions from 2.7% to 19.2%. Many additional benefits of the dynaCERT HG1 and HG2 line of HydraGEN™ technology point to a very short Payback Period for users. The Company reports that certain users of existing HydraGEN™ technology who measure performance and cost-saving results continuously have experienced significant reductions in diesel exhaust fluid (DEF) consumption, significant reductions in diesel particulate matter, resulting in fewer filter (DPF) changes and reductions in the number of annual oil changes. These changes of trucking costs have led to reduced down time of truck usage, reduced costs and reduced truck driver annoyances and also reduced fleet management aggravations. These additional benefits combined with the Company’s new reduced pricing strategy can reduce the Payback Period of the Company’s products to under one year and even lower Payback Periods in numerous circumstances. In quantifying such benefits to end users, the Company has considered the cost of filters for Class 6-8 trucks which can reach and exceed 3 replacements per year at a cost of filters of up to US$3,000 each, DEF at a cost of US$6/gallon and Oil changes at a cost of US$200 per change. The current HG1 5T Unit for 5-10 litre turbo diesel engines which lends itself mainly to smaller trucks such as used in many overseas countries such as India and smaller diesel-powered machinery. The HG2 product line which is designed to be smaller and more compact than the HG1 series, currently lends itself to smaller 1 to 5 litre turbo and non-turbo diesel engines and the significant Reefer market (see press release of 21 September 2017). The Company has completed the design of its new HG1 4.5T Unit, which is now available to its customers, and anticipates that the new HG1 4.5T Unit will lower the Payback Period to end users, substantially more than existing HG1 2.5T Units currently in use. With the Company’s new pricing strategy, and when reviewing the combined financial benefits of the PIT-tested HG1 unit, as described above, the Payback Period at new list prices is calculated to be under 12 months for those targeted vehicles traveling approximately 11,000 miles (18,000 kms) per month. “We’re excited to report these very encouraging results which verify, once again, that our HydraGEN™ technology works to the benefit of our clients,” says Robert Maier COO and Chief Engineer of dynaCERT. The test protocol measured hourly results at different temperature set points of the Reefer’s refrigeration unit to benchmark the engine’s fuel consumption and emission results under various climatic conditions. This was conducted over many months to verify results. These results point dynaCERT’s new HG2 unit to a potential vast market for not only Reefers but also Class 2-5 fixed-body delivery trucks, city buses and average trucks in the European, Asian and India market place. The company has made significant progress in the development of the HG2 unit, which is approximately 25% of the size of the HG1 unit, thereby allowing for a broader range of applications for diesel engines with displacements of up to 5 litres. @dynaCERT $DYA $DYFSF Collaboration with Northwest Territory Power Corp.
dynaCERT announced the collaboration with the Northwest Territory Power Corp. in Yellowknife, NT in a fuel savings and emission reduction pilot project located in Deline, NT. Delines is located on the southwest share of Great Bear Lake, about 400 km northwest of Yellowknife. Deline is only serviced via aircraft and winter ice roads. The NTPC operate 3,500 diesel power generation units in remote villages and communities across the Territory. Pistol Bay expanded the upcoming VTEM airborne electromagnetic and magnetic survey to cover almost twice the area of the original survey plan. Geotech Limited is contracted to survey the 40 km length of the Confederation Lake greenstone belt, southeast of Red Lake, Ontario. With a larger loop, more power and better signal-to-noise resolution than earlier airborne electromagnetic systems, the current version of VTEM™, known as VTEM™ Plus, is able to resolve conductors at significantly greater depths than any previous airborne system. By flying a survey over large areas of favourable geology, Pistol Bay will be exploring a depth slice that has only been investigated in the past by large-loop ground EM systems over very limited areas. Target definition will be materially assisted by two recently acquired data sets. A whole-rock geochemical database with almost 7,000 analyses was inherited from Noranda Exploration by AurCrest Gold Inc. and delivered to Pistol Bay as part of the AurCrest Gold property acquisition (see Pistol Bay news release January 18, 2017). As well, a data set of Selco drill results, many of which were never in the public domain was supplied by the vendor of the Joy North property (see Pistol Bay news release February 22, 2017). Pistol Bay $PST has optioned two additional claim groups in the Confederation Lake greenstone belt, Ontario which brings their land position in this belt to approximately 9,450 ha over a 53 km length of favourable volcanic geology. The two claim groups are called Lucky 7 and Moth groups. The Lucky 7 covers a number of mineralized zones which adjoin the Garnet Lake and Garnet East claim groups. A copper-gold sulphide zone, which apparently grades into a siliceous gold zone at its eastern end, was stripped and drill tested in 2002 by Kings Bay Gold Corp. A zone of massive to disseminated sulphides has been trenched but apparently never drilled. The Moth group of 10 claims comprises 85 units over 1,360 ha and covers a 5.5 km length of favourable geology and its north boundary is only 2 km from former producing South Bay mine.The area was extensively explored between 1970 and the mid 1990s, with at least 14 diamond drill holes. Widespread hydrothermal alteration was noted and there were numerous indications of zinc and/or copper mineralization.